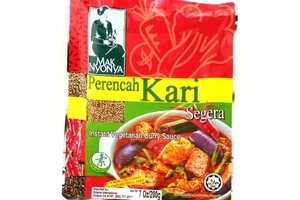 Mak Nyonya Instant Vegetarian Curry Sauce Mix (Perencah Kari Segera Untuk Sayur) in 7oz (200g) sachet. Maknyonya is proud to present, a simplicity in cooking, an easy to present, convenient, tasty as well as delicious in collections of Nyonya sauces. It is the most relaxing way to preparing an easy-to-cook Nyonya delicacy to fill up your family members under the warm environment to enjoy a flavored unique Nyonya food. Product of Malaysia. No Coloring ۾∞ | Cholesterol Free Θ | Vegetarian Certified ◘ | Halal Certified حلال . Maknyonya is concerned and has carefully modulated each kind of the spices, to obtain a healthy as well as tasty Nyonya delicacy. Maknyonya has also recognized the tastes of each flavors and spices in cooking Nyonya delicacies, including the preferences for peanut, coconut, gingers and other fragrances.